INTERFAITH RELATIONS between Catholics and Jews have come a long, long way. And it is a measure of just how strong these ties are today, that so many Jews were disappointed by the content of a Vatican document about the role of the church during the Holocaust published this past week. There was a time when the appearance of an official Vatican report which acknowledged some of the Church's failures would have brought amazement and gratitude from most Jews. Instead the mainstream Jewish reaction has focused - quite rightly in my opinion - on the shortcomings of the report. In other words, most Jews have arrived at a point when they judge the contemporary Catholic church not by the dismal standards of its past with regards to Jewish issues but by the good deeds of its present. Though I too am dismayed by some elements of the Vatican report, I think there is good reason to acknowledge that the glass is at least half full. 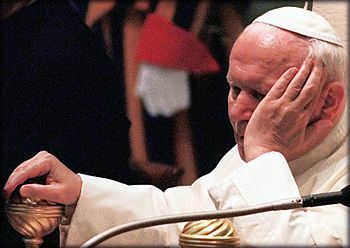 Only those who are blinded by resentment and pain for the outrages committed against Jews in the past can ignore the pronouncements and conduct of Pope John Paul II on Jewish issues and anti-Semitism. He has revolutionized the Catholic attitude towards Jews as well as Israel, which the Church finally recognized some four years ago. It would be churlish to ignore the significance of a Catholic call for "penitence" on the part of the Church and its followers for conduct during the Holocaust as well as for 20 centuries of anti-Semitism. Nor can an objective observer fail to be moved by the understanding manifest in the document of the significance of the Holocaust or by its request that Jews hear their plea "with open hearts." Where once the Church seemed to Jews to be the embodiment of hatred for Judaism and prejudice against the Jewish people, it now clearly stands among the righteous with its whole-hearted condemnation of anti-Semitism. That said, the best homage that Jews can pay to our Catholic friends is to speak to them with honesty about this document and to the history it examines. The problems with the Vatican document are two-fold. First is the report's over-emphasis of the distinction between traditional Christian anti-Semitism and the even more vile modern racist theories of the Nazis. It is entirely correct to recognize such a distinction and to properly term the ideological tenor of the German Nazi regime "neo-pagan" rather than Christian. Yet, one cannot pretend as if Germany and its European allies were not societies in which the Church and its active adherents played major roles. Though a few church leaders spoke out against the Nazis, others cooperated with them while still most kept silent. Others kept up their own drumbeat of anti-Semitism even as the Nazis prepared the way towards Auschwitz. The Vatican document goes so far as to ask whether the Shoah was not "made easier" by the more benign forms of Christian anti-Semitism. It is a question whose affirmative answer is obvious to all students of history but for which the document is unable to provide a clear reply. Rather than merely facilitating the mass murder of the Nazis, the culture of Jew-hatred fed by the "teachings of contempt" from the Church was a prerequisite for it. Christian anti-Semitism also reduced the chances of survival for Jews during the Shoah. The historic record shows that in countries like Poland (where an anti-Semitic church and Catholic political party openly campaigned on a platform of anti-Semitism before the war), Slovakia (where a Catholic priest served as head of the pro-Nazi quisling regime), France and Hungary, church- inspired anti-Semitism left the Jews vulnerable to mass murder. Those who choose to ignore or downplay the importance of Christian anti- Semitism - be they church officials defending their past or conservative Jews who rightly wish to focus the Jewish community on the current-day persecution of Christians in China and Muslim countries - are wrong. Just as troubling is the continued refusal of the Church to come to grips with the record of Pope Pius XII, whom the report defends. There were many instances of righteous conduct by that Pope and his representatives, such as the courageous actions of Cardinal Angelo Roncalli - the future Pope John XXIII - which saved many Jewish lives. But the dominant tone of Pius' record during mankind's darkest hour was realpolitik rather than righteousness. However much he did do, it will always be overshadowed by what he chose not to do. Yet for all of these shortcomings, one cannot help but be encouraged by this process. The Church has come a long way indeed in the past century. Let its truth telling about the past continue and grow. It is on that basis of truth that Catholics and Jews can come together with respect and a common commitment to a world informed by positive religious values. It is with that spirit that I looked at another top news story of the week: the release of the annual report of the Anti-Defamation League's data on anti- Semitic incidents around the state and the nation. There is still plenty to be concerned about. Hate groups continue to pop up on the margins of society. Particularly upsetting is the use that such groups have made of the Internet, which has became a major source of hate speech. Given the unfortunate persistence of anti-Semitism - which is aided by the mainstream media culture's tolerance of figures like Pat Buchanan and Louis Farrakhan - our need for watchdogs is as great as ever. Nevertheless, I believe it would be a mistake for American Jews to focus too much on the question of how to interpret the latest statistics. Given the freedom, prosperity and yes, power, of American Jews in this country, there are bigger problems for us to ponder than anti-Semitic graffiti. The greatest threat to American Jews is not hatred from the margins of society. It is the trend of assimilation and apathy towards Judaism which characterizes all too much of our very mainstream American lives. The best answer to that problem is Jewish education for all, not heightened fears of a hostile world. In previous generations, anti-Semitism could define our communal agenda. No longer. Just as it is essential that the Church come to grips with its past, the Jewish community must focus on its future.